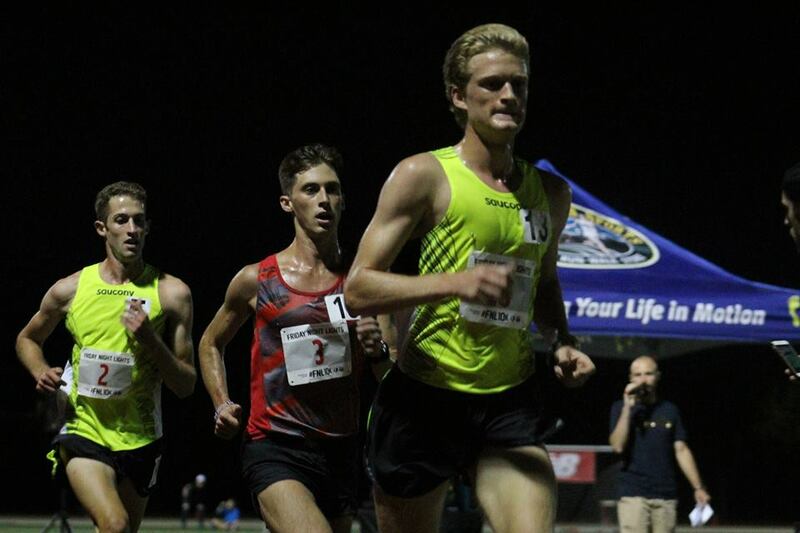 Last Friday evening NE Distance Elite members Aaron Dinzeo and Ian Steller competed in the 3rd Annual Friday Night Lights 10k. The race, which doubled as this year’s USATF-New England 10k Championships, was held at Danehy Park in Cambridge, MA. Aaron finished 2nd in the Elite Field with a time of 30:10 and Ian finished 9th with a time of 31:03. Teammate Henry Sterling (fresh off his 3rd place finish at the Invitational Permit Meet in Bermuda two weeks ago) made the trip up as well to serve as pacer for Aaron. Henry’s pacing duties called for 400m splits of 70s through roughly the first 4 miles, and that is precisely what he delivered. After a quick start, Aaron and Lou’s Serafini – the 2015 defending champion competing for The Heartbreakers and Mizuno – settled in single file behind Henry, who quickly found his rhythm. Lap after lap Henry hit his mark, and lap after lap Aaron was right there tucked in behind Serafini. Shortly after Henry stepped off the track at 6,000m, Serafini put in a surge and opened up a slight gap. Aaron hung tough the last two miles, and at one point managed to gain back some ground, but Serafini threw in another big surge in the 6th and final mile: a move which would ultimately carry him to victory. While Aaron was busy battling it out with Serafini up front, Ian was running a gusty race of his own a few meters back. For 5 long miles he held 3rd place, running completely alone the entire way. He maintained a very even pace during that time – a remarkable feat considering this was only his second time running the grueling 25 lap race – and it wasn’t until mid-way through the 6th mile that another competitor was within striking distance of him. During the last lap he was overcome by a pack of BAA teammates who had been working together throughout the race, but he was still able to dig deep and earn a Top 10 finish in his first USATF Championship race. Full results of the race can be seen here. After cheering her teammates on at the 10k in Cambridge the night before, new NE Distance Elite Team member Rachel Schilkowsky turned her focus to her own race the following morning. 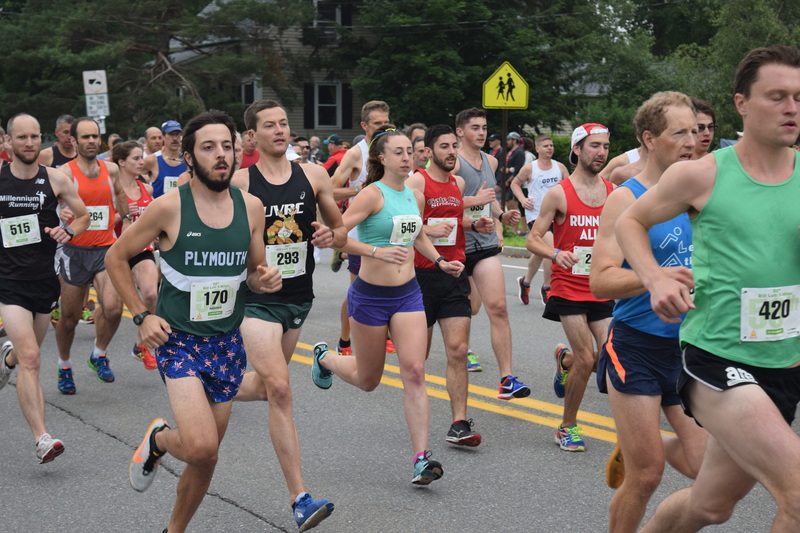 On a cool, overcast day in Concord, NH, nearly 500 runners took to the streets to compete in the 50th Annual Bill Luti 5 Miler. After being on the track for her last few races, she returned to roads on Saturday morning, and did so in spectacular fashion. With her sights set on the existing course record of 28:21, which was set back in 2011, Rachel went out hard from the gun. By the the time she passed the first mile marker, she had established herself as the top female contender as the next woman was over 20 seconds back. With a pack of masters men as her companions, she continue to push the pace over the hilly middle portion of the race. When she hit 4 miles in 22:35 – just under course record pace – she knew she needed a solid last mile to get the job done. When one of the men she had been battling with made a hard move with a half mile remaining, she took off as well, her competitive spirit taking over. Although she was unable to out-kick him in the final 200m of the race, her attempt to beat him had resulted in a final mile of 5:20. With that she crossed the finish line in 27:56, bettering the existing course record by a whopping 25 seconds.